When improving operations, the only distinction of practical relevance is between necessary and unnecessary activities (See Occam’s Razor… and Whack-a-Mole). It really doesn’t matter whether they physically transform a product or whether a hypothetical customer would be willing to pay for them; the only thing that matters is whether they are needed to get the job done. Eliminating the unnecessary means getting the right things done, or being effective. The step after that is getting these things done right, or being efficient. The American literature on Lean is centered on Value Added — defined as “what the customer is willing to pay for.” As I indicated, this is not the case for the Japanese literature or even the American literature on the Toyota Production System (TPS). I listed some examples from my personal library in Occam’s Razor…, and would like here to give more specifics. 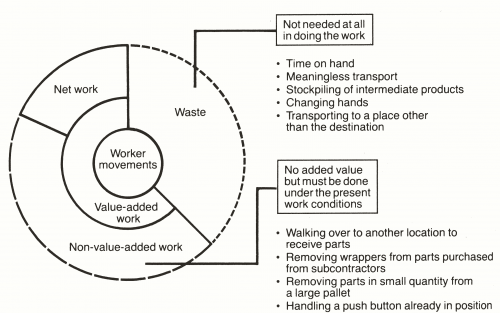 Fundamental Principles of Lean Manufacturing, Shigeo Shingo (1977). The English title contains “Lean Manufacturing,” a term that wasn’t coined until a decade after this book came out. Shingo’s title translates to “Original intent of plant improvement” (工場改善の原点的志向). Zero Inventories, Robert W. Hall (1983). This was the first book in English to cover the technical content of TPS. ‘Doc’ Hall is an American academic, who researched Japanese sources. He is still active today in the AME, and was inducted in the Manufacturing Hall of Fame in 2012. Kanban, Just-In-Time at Toyota, JMA (トヨタの現場管理：カンバン方式の正しい進め方, 1985). This is based on training materials from one of the oldest manufacturing consulting firms in Japan. The Evolution of a Manufacturing System at Toyota, Takahiro Fujimoto (1999). Fujimoto is an academic who studied the emergence of TPS in the history of Toyota and, in the process, explains many details of its development in the 1990s. The heart of introducing TPS (トヨタ生産方式導入の奥義）Mikiharu Aoki (2009). 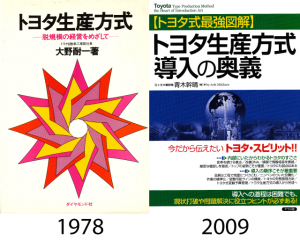 The author left Toyota in 2004 after 26 years to become a consultant. He is still in his fifties, and what he describes is not your grandfather’s TPS. Still, there is not a word about value added. The “Value-added work” caption in the translation does not make sense in its context and does not match the original, which is just one word, “sagyo” (作業) which just means work or operation. The bullet lists in the translation do not match the starred captions in the original, which only contain the first two items. I don’t know why the translator added items to each list. The original figure is in the style of a comic strip, which is almost standard for the Japanese literature on manufacturing. It is not intended to impress readers of the Harvard Business Review, but to communicate with people who read manga while riding trains to work. One vital feature of this discussion is that it is exclusively about the breakdown of operator movements. It is not about materials handlers, managers or any kind of support groups, whose work is branded as intrinsically “non-value added” by managers who have read the US Lean literature. Why this narrow focus on production operators? Most organizations have a subgroup of members who fill its purpose while all others support them. In a hospital, it is the surgeons; in aviation, the pilots; in the military, the shooters; in car racing, the drivers. In a manufacturing company, it’s the production operators. And their time is particularly precious because they work in sequence, so that, if you delay any one of them, you delay the entire production line. This is not true of the support staff, who work mostly in parallel. Even in the restricted sense that he uses, if Ohno had felt that this was an important concept for TPS, he certainly would have used it elsewhere in his book. But he didn’t. Toyota Production System, Yasuhiro Monden, 2nd Edition (1993). Monden is a professor of production management at Tsukuba University, who has been granted extensive access by Toyota. Value Added appears once, on p. 179 of this 423-page book, where he repeats what Ohno had written. 25 keywords of the Nissan Production Way (実践日産生産方式ｷｰﾜｰﾄ25, 2005). This book is about Nissan, not Toyota. Keywords 11-15, on pp. 62-83 are about “the pursuit of Value Added production” (付加価値生産)。 “Value-added tasks,” however, are simply defined as the ones that physically modify the product. The Birth of Lean, Koichi Shimokawa and Takahiro Fujimoto (Ed.) (2009). There is one instance of “value added” on p. 52. Since “internal customers” are really downstream operations that don’t pay, the willingness-to-pay criterion is not applicable, which explains why Liker changes it to what the customer “wants from the process,” and it may not be a physical transformation. For example, what car assembly wants from painting inspection is the assurance that the bodies started on the final assembly line are free of paint defects. Later, on p. 89, the concept migrates to an engineering office. Finally, on p. 280, value-added work is “the actual transformation process core to the service that the customer is paying for.” So the willingness to pay that was excluded on p. 27 is back in, and so is the physical transformation, apparently mashing together the US Lean and Japanese TPS versions of value added. Again, this concept is only referenced in three of the book’s 330 pages, which strongly suggests that it is not important. Toyota is just not that into it. In light of this, why have American Lean authors focused on value-added? They zoomed in on a minor detail, changed the meaning from physical transformation to willingness to pay, and made it the foundation of Lean. My personal guess is that they felt it necessary to attract decision makers under the influence of business schools and uncomfortable with TPS plain talk. If we need to intellectualize the notion of waste elimination, however, we can do it in other ways, for example by stating as a principle that a factory in never Pareto-optimal, meaning that it can always be improved. In fact, it is fortunate that the concept of value added plays such a negligible role in TPS, because, as discussed in More Musings on Muda, its definition in terms of physical transformation doesn’t withstand scrutiny much better than that in terms of willingness to pay. In particular, it is not applicable to anyone who does useful work that does not physically change a product. In addition, in both senses, “value-added” is an attribute that an activities possesses or lacks. In economics or game theory, value added is a quantity of money. This is the basis for Value-Added Taxes (VAT) in countries that charge them and. Aggregate it over an entire country, and you get its Gross Domestic Product (GDP). Out of this Value Added, companies have to pay for people, facilities and equipment, and taxes. I have found this concept useful in several contexts. For example, a plant’s value added per employee is a better measure of productivity than sales per employee, because you can’t game it by outsourcing. I have also found it useful to compare a company’s value added per employee with industry averages that you can retrieve from sources like the US Bureau of Labor Statistics or the Economic Census. But it is clearly not applicable to one production operator at one work station. In game theory, the value added of a player is the amount by which his presence increases the size of the pot. A player who joins a poker table puts more chips in play. A company that sells software to run on a given hardware platform increases the value of this platform, while a competitor providing alternative hardware to run the same software reduces it. As explained in Brandenburger and Nalebuff’s Co-opetition, it is a useful concept in business strategy, but also irrelevant at the level of an individual work station. Yet another use of the term is found in corporate finance, where the Economic Value Added (EVA) is the difference between a company’s net, after-tax profits and its cost of capital. The idea is that, unless a company has a positive EVA, its investors would be better off putting their money elsewhere. None of these uses is applicable to a work station on the shop floor of a manufacturing plant, and there is no way any of them is connected to the notion of willingness to pay. Focusing on what customers are willing to pay for is a direction that might be given to Marketing. Top management must of course be concerned with customers, but also with suppliers, employees, the local community, the environment, local and national governments, not to mention creditors and investors. Because TPS is a system that was developed by an actual company with all these stakeholders and more, it encompasses approaches to supply chain management, human resources, corporate social responsibility, and finance. In this context, the notion that only activities add value only if customers are willing to pay for them is not helpful and is inconsistent with the more general usage of “value added” as a technical term. Hi Michel – Thank you for this thought-provoking post. It’s a subject that is worthy of exploration. As one of the authors/consultants/coaches who regularly defines value-adding (I prefer “ing” or “ed”) as activities the customer values and would be willing to pay for, I’d like to offer some practical reasons why I do and some thoughts about why, perhaps, the subject is treated differently in Eastern vs. Western Lean literature. First, we always need to remember that Toyota grew their business from day one by employing the principles and practices that we attempt to instill into companies who have operated far differently for decades. So what works at Toyota very rarely works anywhere else in exactly the same way it works at Toyota. My unconfirmed hunch is that value-adding wouldn’t roll off the tongues of Shingo, Ohno, Cho, etc. because they didn’t need to view work through that lens. Fast forward to non-Toyota organizations and we’re now faced with how to get people to differentiate between those activities that are effective and efficient (the two criteria I, too, use) versus those that are ineffective and inefficient. In my experience, the value-adding definition (perhaps coined by Womack?) is a convenient way to help people realize that what they’ve always done isn’t necessarily the right thing to do nor an efficient thing to do. The problem is that “value” doesn’t have a concrete definition. What’s valuable to one person isn’t necessarily to another. Enter the financial portion of the definition. I find it a decent way to help people realize that, while they may want 5 signatures on a form that take 8 business days to obtain, most customers neither have the patience for those activities nor are willing to pay for them. And if customers don’t have the patience for the activity nor are willing to pay for them, there’s a good chance the organization will struggle to grow market share and will never recoup those “non-value-adding” expenses in revenue (or funding, in the case of a government agency). For teams for which is concept is particularly head-scratching, I use the example of buying a new car example to help them see that there are features or activities the manufacturer undertake that they, the customer, value and are willing to pay an additional $100 for (e.g. brakes that work) and perhaps others that they would not be willing to pay an additional $100 dollars for (e.g., duplicate data entry, redundant part inspections, etc.). The value/money distinction seems a responsible way to help teams with long-standing paradigms “get it” that unnecessary expenses must be eliminated to not only increase the speed at which they can respond to customers, but to also increase margins along the way. Why not accomplish both business needs at once? You hinted at but never fully developed the trickier issue in my mind, which is not differentiating between value-adding and non-value-adding. It’s the difference between necessary and unnecessary non-value-adding. Using this expanded definition, support functions such as HR, IT, finance, etc fall into the “necessary” bucket. We sometimes refer to them as “value-enabling.” The reason why I personally use this distinction isn’t nearly as much for waste identification, but rather to shift their mindset from being solely internally-focused to being externally-focused. Just as a customer expects an organization to deliver quality, they also expect them to have skilled workers, computers that work, etc. Just as they’re not likely interested in paying for redundant inspection, they’re just as unlikely to pay for cumbersome hiring processes and IT support tickets for a simple change that take months to resolve. I disagree with your statement “there is no way any of them is connected to the notion of willingness to pay.” That’s exactly why I personally use the financial distinction. To help EVERYONE from the front lines to senior leaders begin viewing everything they do through the eyes of their customer. It’s the most useful means I’ve found to date. Comparing and contrasting concepts has historically been an effective way to shift mindsets and help people learn obtuse concepts. Perhaps one day Western organizations will evolve to the point where Toyota began and remains today. Perhaps one day the word “value” and the associated financial definition will melt away and people will intuitively know what’s effective and efficient and what’s not. But until that day, we need some way to help them see and learn. If not value and money, then what? Remember that we’re not working with teams filled with MBAs who understand economic value added. We need a means to help them learn how to identify and eliminate wasteful activities. Again, if not value and money, then what? Hi Karen! Thank you for your detailed comments. One side of James Cameron’s Titanic that I liked was that he showed every deck of the ship from the boiler room to the first-class restaurant. To me, asking shop floor operators what customers are willing to pay for is like asking the workers who shoveled coal into the furnaces what kind of wine the first-class passengers would like with their lamb. They are too many layers removed for the question to be fair, and that is why you have Marketing to research the answers. In the work you describe, I think you can do everything by defining waste as activities whose elimination would not degrade performance in any way. If eliminating X would neither delay deliveries, nor increase costs, nor cause defects, nor depress operators, nor put them in danger, then X is waste. All the seven categories meet this criterion. Any activity that doesn’t, on the other hand, is useful for something. “Necessary and unnecessary non-value-adding” is the kind of phrase laden with multiple negatives that I try to stay away from, as guaranteed to confuse any audience. “Muda” just means unnecessary, and I prefer to leave it at that. If you see a connection between the willingness-to-pay criterion and any of the three other used of “value added” that I listed, I would like to know what that connection is. As far as I can tell, “value added” as used in valued-added tax, in game theory and in corporate finance are not even connected to each other. In general, I try to stay away from discussions of East versus West, and to make too many inferences about what authors might have been thinking when they are not around to speak for themselves.